All of our walks are designed to be easily accessible to as many people as possible. As an environmentally-responsible business, we also encourage our customers to use public transport where possible to access our walks, and the start and finish points of each walk are located close to either a bus stop or a railway station (sometimes both). The start times of the walks are also timed to coincide with the arrival of a convenient bus or train service, with an allowance made for any possible delays. However, we also recognise that it may not always be possible or convenient to use public transport, especially for those of limited mobility, so we also try to locate the start and finish points within reasonable walking distance of a public car park. On this page, we hope to provide you with the most up-to-date information about all of the means by which you can access our walks. In addition to local car parks close to each walk, you can also find information about which buses and trains you can use to access each walk. Not only does this include which services to use, but also up-to-date information about the times of each service, where to get on and off, and how far you need to walk after getting off. While some of the driving directions we give may seem to be a much longer route than you get from your sat-nav or by looking on an online route planner, they have all come from years of personal experience driving the roads concerned. As a result, they take into account conditions on the ground that sat-navs and online route planners may not be aware of. While you are of course free to follow the advice of your sat-nav, you do need to be aware that these may not warn you of things like very narrow roads and bridges, corners and junctions with poor visibility, etc. Please note that, while we try to keep this page as up-to-date as possible, there may be instances where we are not made aware of changes to services at the time they occur. For this reason, we recommend that you always check bus and train times with the relevant operator before travelling. Detailed up-to-date information on the times of all bus services operating within Derbyshire can be found here, while information on train services and fares can be found here. The village of Ashford-in-the-Water is quite easy to access by public transport, as it is served by the hourly High Peak Buses "Transpeak" service running between Derby and Buxton. Besides Derby and Buxton, the buses also call at Belper, Cromford, Matlock Bath and Matlock. On weekdays, the recommended northbound "Transpeak" departs from Derby at 7:30am, and arrives in the village at 8:54am. On Saturdays, the bus departs 20 minutes later at 7:50am, and arrives at 9:06am. Sunday and Bank Holiday services depart from Derby at 8:45am, and arrive into the village at 10:06am. On weekdays and Saturdays, the recommended southbound service departs from Buxton Railway Station at 8:32am, calling at Buxton Market Place at 8:35am, and arriving in Ashford-in-the-Water at 9:07am. On Sundays and Bank Holidays, it departs from the Railway Station at 9:32am, calling at the Market Place at 9:35am, and arriving in the village at 10:07am. 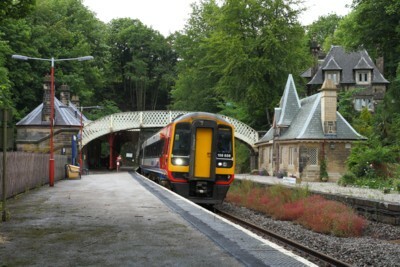 To access Ashford-in-the-Water from Manchester, take one of the regular train services from Manchester Piccadilly to Buxton, and change to the "Transpeak" outside Buxton Station. Please note that, at present, the 7:52am weekday and Saturday train does not arrive into Buxton until 8:47am, which is too late to take the "Transpeak" from outside the station. As a result, you will need to take the 6:48am train, which arrives into Buxton at 7:48am, and then find somewhere in Buxton to have a drink before catching the "Transpeak" to Ashford-in-the-Water. Unfortunately, using the train isn't really an option for Sundays and Bank Holidays, as the first train does not arrive into Buxton until 9:51am, which is too late to connect with the bus. If travelling from Sheffield, Ashford-in-the-Water can be reached on weekdays by taking the 7:30am TM Travel 215 bus service from Sheffield to Bakewell, arriving at 8:30am. You then have 19 minutes wait for the 8:49am "Transpeak" departure to Ashford-in-the-Water, arriving at 8:54am. Unfortunately, as the 215 bus service does not run at weekends and Bank Holidays, it is not an option for those times, and the only option for a Saturday is to take the train south from Sheffield to Derby to join the "Transpeak" there. On Sundays, the options are a lot better, as you can take the 8:30am TM Travel 218 bus service from Sheffield to Bakewell, and then join the 9:59am "Transpeak" service from there to Ashford-in-the-Water. From Chesterfield, you can get to a weekday 9:30am walk by taking the 7:55am Hulleys of Baslow 170 bus service to Bakewell, and then changing to the 9:00am Hulleys of Baslow 173 bus service towards Tideswell. This calls at a stop on New Road in Ashford-in-the-Water at 9:04am, and you then have a walk of about 5 minutes through the village to reach the start point of your walk. Although it it theoretically possible to use public transport to access Ashford-in-the-Water from Chesterfield on a Saturday, the very short connection times make it very risky unless you are prepared to take a train down to Derby to join the "Transpeak" there. For a 10:30am Sunday walk, take the 9:05am Hulleys of Baslow 170 bus service to Bakewell, and change there to the 9:59am "Transpeak" to Ashford-on-the-Water. Ashford-in-the-Water only has one very small public car park. However, as this only has around 8 spaces, it is usually full and so not really an option. As none of our scheduled walks finish in the village, you would also need to use the bus to get back there in order to collect your car. As a result, it is much more practical to park in Bakewell, in either the Bakewell Bridge or Agricultural Centre car parks, and use the "Transpeak" to get to Ashford-in-the-Water for the start of your walk there. Located on the main A6 Derby to Buxton and Manchester road, Bakewell is quite easy to access via public transport. There are two main bus services operating along the A6 through Bakewell, the Trent Barton 6.1 service from Derby to Bakewell, and the High Peak Buses "Transpeak" express service between Derby and Buxton. Both of these operate hourly during the day on weekdays Saturdays, Sundays and Bank Holidays. Along their route, they also call at Belper, Cromford, Matlock Bath and Matlock, with the 6.1 also calling at Wirksworth. It is also possible to access Bakewell by bus from Sheffield on the TM Travel 218 service. On Mondays to Saturdays, the 8:30am departure from Sheffield arrives into Bakewell at 9:20am, which is marginal for a 9:30am start, but in plenty of time for a 10:00am start to a privately-booked walk. The 9:00am departure arrives at 10:00am, which is ideal for a 10:30am start. On Sundays and Bank Holidays, the 8:30am service runs to the same times as weekday services, but the 9:00am service does not run. Bakewell is also accessible from Chesterfield via the Hulleys of Baslow 170 bus service. On weekdays and Saturdays, this departs Chesterfield at 9:05am and arrives in Bakewell at 9:50am, which is ideal for a 10:30am start to your walk. On Sundays and Bank Holidays, it departs from Chesterfield at 9:00am, arriving into Bakewell at 9:42am. It is even possible to access Bakewell by public transport from Manchester by taking the train from Manchester Piccadilly Station to Buxton, and then taking the "Transpeak" from the stop outside Buxton Station to Bakewell. To do this, you will need to take the 6:48am train from Manchester Piccadilly, which arrives into Buxton at 7:48am, and then find somewhere in Buxton to have a drink before catching the 8:32am "Transpeak" to Ashford-in-the-Water. Unfortunately, using the train isn't really an option for Sundays and Bank Holidays, as the first train does not arrive into Buxton until 9:51am, which is too late to connect with the bus. At the end of a walk terminating in Bakewell, you can use either the "Transpeak" or Trent Barton 6.1 services to return home to Matlock, Belper or Derby. These both depart hourly from the stop on Matlock Street. It is also possible to use the "Transpeak" to return to Manchester by changing to the train at Buxton. Please note that the last 6.1 departure from Bakewell is 5:55pm on Sundays and Bank Holidays, and 5:30pm at other times (6:30pm for Matlock only). The last "Transpeak" departures towards Derby are 6:26pm on weekdays, and 6:30pm weekends and Bank Holidays. Towards Buxton, the last "Transpeak" departures are 7:24pm weekdays, 6:59pm Saturdays, and 8:47pm on Sundays and Bank Holidays. If you need to return to Chesterfield or Sheffield from Bakewell at the end of your walk, then the Hulleys of Baslow 170 service runs regularly between Bakewell and Chesterfield until 6:00pm (6:05pm Sundays and Bank Holidays), while the TM Travel 218 service runs regularly between Bakewell and Sheffield until 7:15pm (7:25pm Sundays and Bank Holidays). The Derbyshire Wayfarer day rover ticket is valid on all of the buses listed above. More information on the validity of the Derbyshire Wayfarer ticket can be found here. If travelling from Manchester, it is possible to use the Greater Manchester Wayfarer day rover ticket on all bus and train services to and from Buxton and Manchester, including the "Transpeak" to or from Bakewell. By far the most convenient car park in Bakewell for most of our walks beginning or ending there is at Bakewell Station. This is a 28-space pay-and-display car park operated by the Peak District National park, and is conveniently located right next to the Bakewell end of the Monsal Trail. Unfortunately, this does mean that, on busy days, it can be a problem finding a space, so you may need to use the larger car park by Bakewell Bridge instead. If you are travelling by car, the walk information sheet you will be sent along with your booking confirmation will contain advice on the best places to park and what public transport we recommend you use in order to collect your car at the end of your walk. Situated just 8 miles north of Derby, Belper is very well served by public transport. In addition to the hourly train services between Matlock, Derby, Nottingham and Newark, the town is also served by a number of bus services from Derby, Ripley, Wirksworth, Matlock, Bakewell and Buxton. From Derby, Trent Barton operate four buses every hour along the A6 as part of their "Sixes" network. One of these is a circular service between Derby and Belper (the 6.4), two run between Derby and Ripley (the 6.2 and 6.3), while the 6.1 service runs between Derby and Bakewell via Wirksworth and Matlock. The fifth service in the "Sixes" network is the semi-fast 6.X, which runs from Derby to Belper along the A38. All of these buses can be used to return to Ripley, Derby, Wirksworth, Matlock or Bakewell at the end of your walk. Please note that Sunday and Bank Holiday services on the "Sixes" are limited, with a reduced frequency of service. Another regular bus service through Belper is the hourly High Peak Buses "Transpeak" service between Derby and Buxton via Bakewell and Matlock. Belper is also accessible from Ashbourne via the regular Yourbus 113 service, which can also be used to return to Ashbourne at the end of your walk. This service runs Mondays to Saturdays, with no Sunday or Bank Holiday service. The trains through Belper are operated by East Midlands Trains, and run hourly on weekdays and Saturdays between Matlock and Newark via Derby and Nottingham. On Sundays and Bank Holidays, the services are more limited, and usually run every two hours from late morning onwards. Journey time to and from Derby is approximately 12 minutes. As the trains from Matlock and Derby both arrive ito Belper only a couple of minutes either side of each hour, you will need to take the 8:37am departure from Matlock, or the 8:52am departure from Derby, and spend around an hour passing the time in Belper prior to the start of a 10:00am walk. Fortunately, Belper has many excellent cafes in which you can do this. The Derbyshire Wayfarer day rover ticket is valid on all buses to and from Belper at all times, and on all trains after 9:00am on weekdays (any time at weekends and Bank Holidays). More information on the validity of the Derbyshire Wayfarer ticket can be found here. Belper has a number of convenient pay-and-display car parks in and around the town centre, plus a limited amount of free parking. The largest car park is the pay-and-display car park on Field Lane (197 spaces), which is located just off the main shopping area of King Street and adjacent to Belper Railway Station. Pay-and-display car parking is also located at Belper River Gardens (56 spaces), which is very convenient for our walks starting at The Triangle, and on Shortlands (33 spaces), which is adjacent to the start point of walks beginning from there. Due to the higher cost of parking, we do not recommend the use of the car parks on Green Lane or Bridge Street, as these are "short stay" car parks charged at a higher rate. Belper does have two free car parks, at The Coppice (next to the Market Place, 200 spaces) and at the far end of Derwent Street (off the A6 Bridge Street, 140 spaces). However, the long-term future of the Derwent Street car park is uncertain, as the area is earmarked for commercial and residential redevelopment. Also, The Coppice is used by many people around the area as a "commuter" car park, parking there all day and catching the train to Derby, and also by many of the shop staff in the town. As a result, it can be very difficult to find a parking space there on a working weekday. For this reason, there are on-going discussions over the future of The Coppice and the possible imposition of a maximum time limit on stays there in order to free up spaces for shoppers in the town. Due to the uncertainly and problems concerning the free car parks in Belper, we recommend that, while it will result in you having to pay a small charge, you would probably be better to use one of the pay-and-display car parks in the town, rather than trying to use one of the free ones. We also do not recommend the use of the car parks at The Co-Operative on Strutt Street, Morrisons or B&M/Aldi, as these all have a strictly enforced two-hour maximum stay, which is not long enough for you to complete your walk and would result in you receiving a significant fine. Out of all of the places we use as start and end points for our walks, Brierlow Bar used to be the most difficult to access via public transport, which was why we actually broke with our usual policy and recommended that you use a car in preference to public transport. However, recent changes to bus services now mean that it is much easier to access via public transport. By far the easiest way to get to this walk, and the method we recommend in most cases, is by using the High Peak Buses "Transpeak" service between Derby and Buxton, which also calls at Belper, Matlock and Bakewell. This runs hourly and calls at stops directly outside the Brierlow Bar Bookshop. For this walk, you should take the 8:45am departure from Derby, which arrives at Brierlow Bar around 25 to 30 minutes before the start of the walk. From Buxton, take the 10:35am departure from the Market Place, which arrives at Brierlow Bar around 10 minutes before the start of the walk. At the end of the walk, you can then use the "Transpeak" to return to Buxton, or to head south towards Bakewell, Matlock, Belper and Derby. Southbound services depart at 2:46pm, 4:06pm and 5:04pm, with northbound services to Buxton departing at 3:25pm, 4:25pm, 5:25pm and 6:20pm. You can also return to Buxton on the High Peak Buses 442 service, which departs from Brierlow Bar at 3:17pm, 5:08pm and 6:08pm. If travelling from further afield, you can reach Buxton by public transport from Chesterfield, Sheffield, Macclesfield, Stockport and Manchester. From Manchester and Stockport, take the 9:11am Northern Rail train service from Manchester Piccadilly to Buxton, arriving at 10:09am. You can then take the 10:32am "Transpeak" bus service from the stop opposite the railway station, arriving at Brierlow Bar around 10 minutes before the start of the walk. Please note that, if you use the bus back to Buxton, most of these call at Buxton Railway Station, so check with the driver when you board the bus if you intend to use the train back to Manchester. From Macclesfield, you can use the High Peak Buses number 58 service, which departs Macclesfield at 9:15am and arrives into Buxton at 9:51am after a journey over the spectacular Cat & Fiddle route. Return services to Macclesfield depart every hour up to 6:08pm. From Chesterfield, take the Hulleys of Baslow 170 bus service to Bakewell, departing from Chesterfield at 9:05am and arriving into Bakewell at 9:50am. This then gives you 10 minutes to wait for the 10:00am "Transpeak" departure towards Buxton. At the end of the walk, take the "Transpeak" back to Bakewell, and then the 170 bus back to Chesterfield. From Sheffield, first take the 8:25am TM Travel 218 bus to Bakewell (8:30am weekends and Bank Holidays). There, you wil have around 40 to 45 minutes to wait for the 10:00am "Transpeak" bus towards Buxton. At the end of the walk, you can either take the "Transpeak" back to Bakewell, and change there to the 218 bus back to Sheffield, or take the "Transpeak" into Buxton, from where you can take the Stagecoach Chesterfield number 65 service to Sheffield. The Derbyshire Wayfarer day rover ticket is valid on all of the buses listed above. More information on the validity of the Derbyshire Wayfarer ticket can be found here. If travelling from Manchester, it is possible to use the Greater Manchester Wayfarer day rover ticket on all bus and train services to and from Buxton and Manchester, including the buses out to Brierlow Bar. Free car parking is available at Brierlow Bar bookshop during opening hours (usually 9:30am to 5:30pm). If using the car park, you may wish to also visit the bookshop after the walk - as if you visit beforehand, you may well end up losing yourself in there and missing the start of the walk! As a major tourist destination on the edge of the Peak District, Buxton is quite well served by public transport, allowing access from Derby, Belper, Matlock, Bakewell, Ashbourne, Sheffield, Chesterfield, Macclesfield and Manchester. If travelling from Derby, Belper, Matlock or Bakewell, it is easy to get to Buxton on the High Peak Buses "Transpeak" service, which runs hourly every day in each direction between Derby and Buxton. This means that you can use it either to get to Buxton for a walk starting from there (or another location nearby by changing to another bus service in Buxton), or to get home from a walk finishing in the town. Buxton is also accessible from Sheffield via the Stagecoach Chesterfield number 65 bus service, which follows an enjoyable scenic route across the Peak Distict National Park. The 9:35am departure from Sheffield arrives into Buxton at 10:58am, making it ideal for a walk starting from 11:30am onwards. To return to Sheffield from Buxton, take the 5:36pm number 65 departure (weekdays and Saturdays) from Buxton to Chesterfield, and change there to the X17 service to Sheffield. On Sundays and Bank Holidays, the last bus from Buxton to Sheffield is the 4:06pm number 65 departure from Buxton, which arrives into Sheffield at 5:30pm. From Chesterfield, you can get to Buxton via the Hulleys of Baslow 170 and 66 bus services, which also follow an enjoyable scenic route across the Peak District. The Hulleys of Baslow 170 service departs from Chesterfield at 10:05am, arriving at Baslow Nether End at 10:35am. Here, you must change to the number 66 service, which will take you on to Buxton, arriving at 11:19am. Please note that these services do not run on Sundays and Bank Holidays. To return to Chesterfield from Buxton, you can take the 4:46pm Hulleys of Baslow number 66 service from the Market Place, which arrives at Baslow Nether End at 5:30pm. From there, you can take the number 170 service onwards to Chesterfield, arriving at 6:00pm. Please note that the number 66 service does not run on Sundays or Bank Holidays. Alternatively, you could take the 4:40pm "Transpeak" to Bakewell, and change there to the 6:00pm Hulleys of Baslow 170 service to Chesterfield (6:10pm Sundays & Bank Holidays), or take the High Peak Buses number 65 service from Buxton to Sheffield and then take a bus or train from there to Chesterfield. Buxton is also easily accessible from Macclesfield via the High Peak Buses 58 service, which runs hourly in each direction over the spectacular Cat and Fiddle route. From Ashbourne, you can get to Buxton on the High Peak Buses 441 and 442 services, with either a 9:30am 441 or 10:05am 442 departure from Ashbourne arriving into Buxton in plenty of time for an 11:00am or 12:00pm start to your walk respectively. To return to Ashbourne at the end of the day, the 5:36pm 442 departure from Buxton arrives into Ashbourne at 6:50pm. From Manchester, we recommend that you use the regular train service operated by Northern Rail. These run hourly from Manchester Piccadilly, and take approximately an hour to reach Buxton. Return journeys also run hourly until late evening. The Derbyshire Wayfarer day rover ticket is valid on all of the buses listed above. More information on the validity of the Derbyshire Wayfarer ticket can be found here. If travelling from Manchester, it is possible to use the Greater Manchester Wayfarer day rover ticket on all bus and train services between Buxton and Manchester, and you can also use it on the "Transpeak" to or from Bakewell if needed. Although Buxton has a large number of car parks around the centre of town, many have strictly enforced time limits that make them unsuitable to use for anything other than a short walk around the town. If you want to park in Buxton, then we recommend that you use either the Market Place (52 spaces, 10 hours maximum), Market Street (86 spaces) or The Slopes (62 spaces, 10 hours maximum). However, if you are doing a Monsal Trail walk, then we usually recommend that you park in Bakewell and use the bus to travel between there and Buxton, as it is much easier to park in Bakewell than it is in Buxton. Located on both the main A6 road between Derby and Buxton and the Derby to Matlock railway line, Cromford is very easy to get to via public transport. Probably the quickest, easiest and cheapest way to get to our walks starting in Cromford is by train. These are operated by East Midlands Trains, and run hourly in each direction between Matlock and Newark via Belper, Derby and Nottingham (every two hours on Sundays and Bank Holidays). Cromford Station is located around five minutes walk from Cromford Meadows and the Canal Wharf, where both of our Cromford-based walks begin from, and the adjacent Cromford Mill, where our village walk ends. The trains also call at Ambergate Station, making them ideal for a return home at the end of a walk along the Cromford Canal. Cromford is also served by a number of bus services. The two main ones are the Trent Barton "Sixes" 6.1 service between Derby and Bakewell, and the High Peak Buses "Transpeak" service between Derby and Buxton. Other bus services through Cromford provide access to and from other destinations including Ashbourne, Alfreton, Ripley and Crich. The Trent Barton 6.1 service runs hourly between Derby, Belper, Wirksworth, Cromford, Matlock and Bakewell, calling in the village of Cromford at the Market Place. From there, it is a short walk of about 5-10 minutes to the start point of your walk. This bus can also be used to return home at the end of a village walk, but cannot be used to return home from the end of a walk along the Cromford Canal as it does not call at Ambergate. The High Peak Buses "Transpeak" is a semi-fast service along the A6, running hourly between Derby and Buxton. As a semi-fast service following a shorter route, it is much quicker than using the Trent Barton 6.1, but also more expensive. In Cromford, it calls at stops located either side of the traffic lights at Cromford Crossroads. From these stops, it is a short five-minute walk to the start point of your walk. As the "Transpeak" also calls at Ambergate, it can also be used for a return home at the end of a walk along the Cromford Canal. Other buses through Cromford include the Littles 140 and 141 services, which run between Matlock, Crich, Ripley and Alfreton, and the Yourbus 110 and 111 services between Matlock, Wirksworth and Ashbourne. The Derbyshire Wayfarer day rover ticket is valid on all trains after 9:00am on weekdays (any time at weekends and Bank Holidays), and at all times on all buses via Cromford. More information on the validity of the Derbyshire Wayfarer ticket can be found here. However, it may be cheaper to buy individual fares for each journey unless you are travelling a significant distance. There are three pay-and-display car parks located very close to the start points of our Cromford-based walks. These can be found at Cromford Canal Wharf, Cromford Mill and Cromford Meadows. All three of these are just a couple of minutes walk at most from the start points of our walks, and provide plenty of spaces even on busy days, so you should have no trouble finding somewhere to park. If you are doing one of our Cromford Canal walks, then we recommend that you park in the pay-and-display car park at Ambergate Station, and take the train or bus from there to Cromford. This saves you having to hang around at Ambergate for up to an hour waiting for the train or bus back to Cromford to collect your car from there. As it is located on the "Hope Valley Line" between the two cities, the village of Edale is easily accessible by train from both Sheffield and Manchester. As both of these cities have good connections to the surrounding area, it can also be accessed from many other towns and cities including Derby, Nottingham, Buxton, Chesterfield and Matlock. Trains to Edale run hourly at weekends, and every two hours on weekdays, and the station at Edale is located just a couple of minutes walk from the start and end point of our Edale walks. The recommended service from Sheffield to Edale departs from Sheffield at 9:14am and arrives at Edale at 9:47am, giving you some time to explore the village before the start of your walk. At the end of the walk, weekday and Saturday trains depart from Edale for Sheffield at 4:32pm, 5:34pm and 6:32pm, with other services running into the late evening. On Sundays, most services run 3 minutes earlier. From Manchester, the recommended service to Edale departs from Manchester Piccadilly at 9:40am on weekdays, arriving into Edale at 10:23am. On Saturdays, we recommend that you take the 8:49am departure from Manchester, arriving into Edale at 9:32am. This does mean that you will have around an hour to wait for the start of the walk, but as the next train doesn't arrive into Edale until 10:32am, it arrives just too late for the start of a scheduled walk. However, it would be suitable for a private walk starting at 10:45am or later. On Sundays, we recommend that you take the 9:31am departure from Manchester Piccadilly (8:31am from March 31st), arriving into Edale at 10:16am (9:15am from March 31st). Trains back to Manchester depart from Edale at 4:47pm, 5:47pm and 6:47pm on weekdays and Saturdays, or 1 minute earlier on Sundays. Again, other services run until late evening. There are no scheduled bus services to and from Edale, and it is not covered by any demand-responsive "dial-a-bus" services. As Edale is within the areas covered by both the Derbyshire Wayfarer and Greater Manchester Wayfarer day rover tickets, it is possible to use either of these to access walks beginning and ending there. Both may be used on any train services to and from the village at weekends and on Bank Holidays, and the Derbyshire Wayfarer may also be used on the 9:14am train from Sheffield to Edale on weekdays as well. As the Greater Manchester Wayfarer is not valid on weekday trains until 9:30am, it is not possible to use this on the 8:49am weekday train to Edale. Parking in Edale is quite limited and very popular. This means that it can be difficult to find a parking space unless you are prepared to arrive early. Edale has one main pay-and-display car park by the entrance to the village (138 spaces, �5.00 for up to 10 hours), plus a smaller 20-space pay-and-display car park at Edale Station (�2.50 all day). While it is possible to drive into Edale from the west, this is not really recommended as it involves a steep and winding descent into the valley, and the road into the village from the west is so narrow that it is very difficult for modern traffic to pass. It is therefore much better to approach the village from the east, via the nearby village of Hope, as the roads along this route are much better. From areas to the south, such as Derby, Nottingham, Matlock or Bakewell, the best route is to travel via Grindleford, Hathersage and Bamford to Hope. From Sheffield, the recommended route is via the A57 to the Derbyshire Dams by Bamford, and then turn left down through Bamford to the junction with the A6187, turning right to head into Hope. From Manchester, you can either take the A57 via Glossop and Snake Pass to Bamford, and then join the A6187 to approach Hope from the east, or follow the A6 to Chapel-en-le-Frith and then turn onto the A625 Sheffield Road towards Castleton. As you approach Castleton, do NOT be tempted to turn left onto the road that loops around the base of Mam Tor. Although a sat-nav may say this is the best route to follow, this is the road mentioned above involving the steep and winding descent and the very narrow roads unsuited to modern traffic. It is therefore much better to follow the road around to the right, and then turn left to descend Winnat's Pass into Castleton. Following the road through Castleton will then bring you into Hope from the west. For most sat-nav systems, the easiest way to make sure you follow this recommended route is to set Hope as an intermediate waypoint, rather than simply asking it to take you direct to Edale. Once in Hope, look for the church (on the left if approaching from the east, or on the right if approaching from the west). Directly opposite the church, you will see the road leading to Edale. Although some care is needed when driving on this road, it is still much better than using the road into Edale from the west, and so this is why we recommend you use this one even if the road in from the west seems much better on the map or sat-nav. By far the easiest way to access our walks starting at either Miller's Dale Station or Wyedale Car Park is to take the bus from Buxton Market Place or Railway Station. For an 11:30am start from Wyedale Car Park or a 12:00pm start from Miller's Dale Station, we recommend that you take the 11:06am Stagecoach Chesterfield number 65 bus from Buxton Market Place. This will call at Topley Pike, close to Wyedale Car Park, at 11:13am, and at Miller's Dale at 11:20am. From the stop at Topley Pike, it is then a short walk of a couple of minutes along the road to Wyedale Car Park, while Miller's Dale Station is a short walk up a reasonably steep hill from the bus stop. Please note that, given the distance the bus has to come from Sheffield to Buxton, the number 65 is somewhat notorious for running late, with delays of 20 minutes or more at times. For a 10:30am start from Miller's Dale, such as for our Miller's Dale to Chelmorton circular walk, the only way to get there from Buxton is via the 9:06am number 65 departure from Buxton, arriving at Miller's Dale at 9:20am. Given that this would then leave you waiting at Miller's Dale for well over an hour, we do not recommend this unless you have other plans to explore the Miller's Dale area while you are waiting. On Sundays and Bank Holidays, the first number 65 does not depart from Buxton until 11:06am, meaning that it is not possible to reach Miller's Dale in time for the 10:30am start of a scheduled walk. If traveling from further afield, you can get to Buxton by any of the means described above, and then change to the 65 bus for onwards travel to Wyedale or Miller's Dale. If travelling from the Derby, Belper, Matlock or Bakewell areas, we recommend that you use the High Peak Buses "Transpeak" service to Buxton. The 8:45am departure from Derby arrives into Buxton at 10:40am, in plenty of time to connect with the 11:06am number 65 bus. If travelling from Manchester for a walk beginning at 11:30am or 12:00pm, then we recommend that you take the 9:11am train from Manchester Piccadilly, which arrives into Buxton at 10:09am. It is possible to take a later train at 9:48am but, as this does not arrive into Buxton until 10:48am, it leaves little leeway for any delays along the way if taking the 11:06am bus to Miller's Dale. Both Wyedale Car park and Miller's Dale are very easy to access from Sheffield and Chesterfield, as they are both on the route of direct bus services to Buxton. From Sheffield, the 9:35am Stagecoach Chesterfield number 65 bus service calls at Miller's Dale at 10:44am, and at Topley Pike for Wyedale at about 10:50am, which is ideal for an 11:30am start from there. From Chesterfield, taking the 10:05 Hulleys of Baslow number 170 service to Baslow Nether End and changing there to the number 66 bus service (Monday to Saturday only) will get you to Miller's Dale at 11:01am, and at Topley Pike for Wyedale at about 11:06am, making it suitable for an 11:30pm start from either. For walks finishing at Miller's Dale, you can then use the Stagecoach Chesterfield number 65 service to return to Buxton. These call at Miller's Dale at 2:44pm, 4:44pm and 6:44pm. Journey time into Buxton is approximately 15 minutes. For onwards travel from Buxton, you can then take the "Transpeak" southwards to Bakewell, Matlock, Belper and Derby, or one of the regular trains from Buxton to Manchester. You can also use the number 65 buses to return to Sheffield and Chesterfield. The Stagecoach Chesterfield number 65 bus to Sheffield departs from Miller's Dale at 4:20pm, with an additional departure at 5:50pm on Weekdays and Saturdays. While the 4:20pm departure goes straight to Sheffield, the 5:50pm departure goes to Chesterfield, and you must change there onto the X17 service for onwards travel to Sheffield. Alternatively, you can return to sheffield by travelling back into Buxton, and then taking the "Transpeak" down to Bakewell, where you can change onto the number 218 bus as detailed here. To return to Chesterfield, your best option is to take the number 65 bus into Buxton as detailed above, and then take the "Transpeak" to Bakewell. 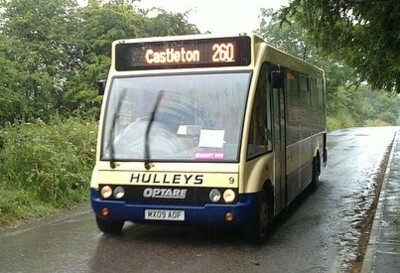 There, you should change to the Hulleys of Baslow 170 service for onwards travel to Chesterfield. The Derbyshire Wayfarer day rover ticket is valid on all of the buses listed above. More information on the validity of the Derbyshire Wayfarer ticket can be found here. If travelling from Manchester, it is possible to use the Greater Manchester Wayfarer day rover ticket on all bus and train services to and from Buxton and Manchester, including the buses out to Miller's Dale and Wyedale. It is possible to access both Miller's Dale and Wyedale by car. Pay-and-display car parking is available at both Miller's Dale Station (80 spaces) and Wyedale Car Park (28 spaces). However, Wyedale Car Park is very popular, especially with local fishermen on the River Wye, and so it can be very difficult to find a space there at weekends and Bank Holidays. For this reason, we usually recommend that you park elsewhere and use the bus to get to walks beginning from Wyedale Car Park. To reach Miller's Dale, follow the main A6 road to between Buxton and Taddington, and then turn off the A6 following the signs for the B6049 to Tideswell and Miller's Dale. This will then make the steep and winding descent down Blackwell Dale into Miller's Dale. Having crossed the bridge over the River Wye, turn left following the sign for Wormhill and the Monsal Trail. After passing under two low bridges on the steep hill up the side of the Dale, you will then see the entrance to Miller's Dale Station on the left. Wyedale Car Park is much easier to find, as it is on the A6 just opposite the entrance to Topley Pike Quarry. While it is possible to use the bus to return to Miller's Dale or Wyedale to collect your car at the end of a walk, this can be difficult and time-consuming due to the low frequency of buses. For this reason, we usually recommend that, for Monsal Trail walks from either start point to Bakewell, you park in Bakewell and use the "Transpeak" and 65 bus services to get to the start point of your walk. Although accessible by public transport, Taddington is only served by one regular bus service, the hourly High Peak Buses "Transpeak" service between Derby and Buxton. For a 9:30am start from Taddington, we recommend taking the 7:30am "Transpeak" departure from Derby (7:50am Saturdays), which arrives into Taddingtom at 9:03am (9:14am Saturdays). Please note that Sunday and Bank Holiday "Transpeak" services do not begin until 8:45am. As this service does not arrive into Taddington until 10:14am, it is not possible to get to Taddington by public transport from Derby, Belper, Matlock or Bakewell in time for a 9:30am start on Sundays and Bank Holidays. If travelling from Buxton, the southbound "Transpeak" departs from Buxton at 8:35am and arrives into Taddington at 8:58am - this southbound service operates every day including Sundays and Bank Holidays. For an 11:00am start from Taddington, we recommend the 8:45am departure from Derby (including Sundays and Bank Holidays), or the 10:35am departure from Buxton, which arrive into Taddington at 10:16am and 10:58am respectively. At the end of a walk finishing in Taddington, you can then use the "Transpeak" to return home, with hourly southbound departures towards Derby at two minutes to each hour up to 2:58pm, then 4:18pm and 5:17pm (4:13pm and 5:13pm weekends & Bank Holidays). The northbound departures towards Buxton are at 14 minutes past each hour up to 5:14pm. The Derbyshire Wayfarer day rover ticket is valid on all of the buses listed above. More information on the validity of the Derbyshire Wayfarer ticket can be found here. If travelling from Manchester, it is possible to use the Greater Manchester Wayfarer day rover ticket on all bus and train services to and from Buxton and Taddington. Taddington has no public car parking at all. The only way to park within the village is to park on the road through the village, which is not recommended due to its narrowness and the need to allow access through the village for the buses and other vehicles. The closest public car park is the pay-and-display car park on the A6 at White Lodge, a couple of miles south of the village at the bottom end of Taddington Dale. If you park here, you can then take the "Transpeak" from the stop outside the car park into Taddington, and then back to the car park at the end of your walk. Other car parking is available in Buxton and Bakewell, from where you can also use the "Transpeak" to get to and from Taddington for your walk. The Derbyshire Wayfarer day rover ticket allows virtually unlimited travel around Derbyshire. It is valid on the majority of bus services operating within the county of Derbyshire, and can be used on these services at any time of day or night. It is also valid on train services within the county for journeys beginning after 9:00am on weekdays, or at any time of day on weekends and Bank Holidays. It can also be used on a number of bus and train services to and from destinations located outside the county. The ticket is valid on bus services operated within Derbyshire by the following companies: Aim�e's, Arriva Midlands, Ashbourne CT 'Derbyshire Connect', D&G, First, G & J Holmes, High Peak, Hulleys of Baslow, Kinchbus, Little's Travel, Midland Classic, Notts & Derby, Stagecoach, TM Travel, Trent Barton, Warringtons, Yourbus. In addition to services entirely within the county of Derbyshire, the ticket can also be used on services between Derbyshire and the following locations: Sheffield (city centre), Macclesfield (town centre), Leek (town centre), Burton-on-Trent (town centre) and Uttoxeter (town centre). The ticket can't be used on local buses within Sheffield, Macclesfield, Leek, Burton-on-Trent or Uttoxeter, but does allow travel to or from any of these locations on direct services to or from any location in Derbyshire. The ticket is also valid within Staffordshire on Services 441 and 442, within Nottinghamshire on Service 15 (Ilkeston - Sawley), between Derbyshire and East Midlands Airport on Services SKY (Skylink and Skylink Nottingham), and between Glossop and Holmfirth on Service 351. The ticket can be used on the above lines on trains operated by Cross Country Trains, East Midlands Trains, Northern Trains and TransPennine Express. Please note that the ticket is not valid to or from East Midlands Parkway. A map showing the area within which the Derbyshire Wayfarer ticket is valid is available from Derbyshire County Council here. The latest information on the price of a Derbyshire Wayfarer, where to purchase it in advance or on the day of travel, and the discounts at visitor attractions you can get by using a Derbyshire Wayfarer can be found here. This website is © Derbyshire Heritage Walks, 2017.